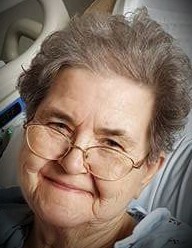 Muriel “Ellen” Pierson Sharpe, age 79 of Laurinburg passed away Monday, January 28, 2019. Ellen was born September 26, 1939 in Scotland County, a daughter of the late Cecil B. Pierson and Ruth Carolyn Butler Pierson. She retired after many years of service with Toastmaster, Inc. She attended Multitudes Church and in her leisure time, she enjoyed working puzzles, word search books and listening to Elvis Pressley music. She also enjoyed traveling and watching the Food Network Channel. She was an avid sports fan of the Carolina Tar Heels and the Atlanta Braves. Ellen’s greatest joy was spending time with her family. She always wanted everyone to be happy and will always be remembered as a dedicated mother, grandmother, sister, aunt and friend. Along with her parents, she is preceded in death by her brother, Cecil B. Pierson, Jr.
Ellen leaves behind her sons, Robert “Robbie” Sharpe (Cindy), James Sharpe (Melanie) all of Wagram, Charles “Chuck” Sharpe of Pocatello, Idaho; daughter, Susan S. Kendall (Billy) of Ozona, TX; sisters, Delores Pierson of Troy, Betty Bracey, Judy Voss, both of Laurinburg and Kim Pierson of Wilmington; sister in-law, Mary Ellen Falls of Waycross, GA; eight grandchildren, five great grandchildren and a host of loving nieces, nephews and many friends. Funeral services will be conducted at 3:00 p.m., Friday, February 1, 2019 at the Richard Boles Funeral Chapel, officiated by Rev. Woody Byrd and Rev. Opie Swails. Burial will follow in Spring Hill Cemetery. The family will receive friends prior to the service on Friday from 1:30 until 3:00 p.m. at the funeral home.